Every in home session we do is completely different and that’s because every couple is different. There is something about intense and quiet at the same time about documenting human connections. Fortunately, he’s always hungry (some serious creative polyphagia going on here). And when we are photographing a couple in their personal space is a dream. An in-home session is to be invited into the physical space a relationship exists, a couple’s home, is to document love in it’s most natural habitat. Especially as photographers that crave intimacy with their subjects, we love it. And to witness those quiet, vulnerable moments and the tiny touches, and know that between these two humans you are seeing something beautiful and rewarding and special and soft and perfect, is magical. 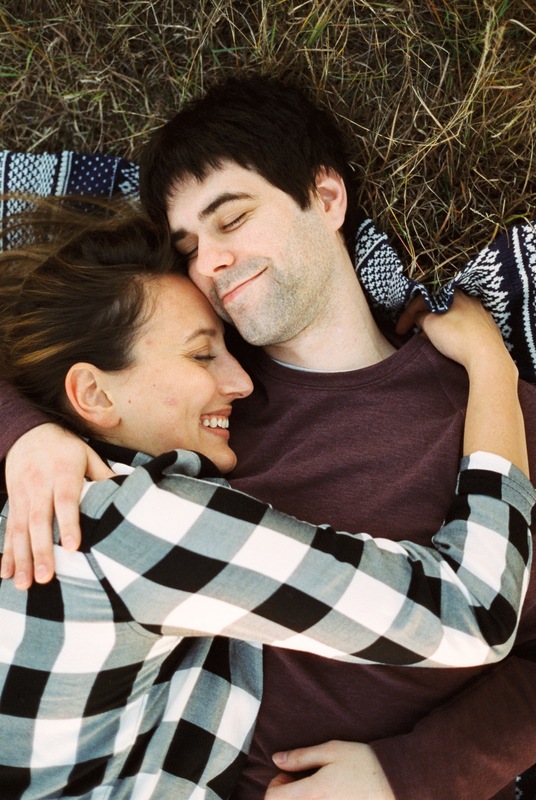 This session with Lindsey and Mat is intensely candid and perfectly encapsulates their fun and hilarious relationship. And it was kinda a creative smorgasbord. We spent the first half of their session exploring their favorite spaces in their home and then we got to enjoy our favorite light of all time: golden hour sunset and into twilight. The rattlesnake habitat at Indian Springs Metropark is an amazing place to go in the fall. The light, the trees, the fields of goldenrod. It’s friggin’ amazing. Ooooo! I love everything about this! From the tones to their connection. Such a beautiful engagement session! I love how real and intimate they are in front of the camera. Great job capturing that! I love the joy that these two show for each other in their smiles! Some people are just meant to be together. And these two are just that! Whoa– you had me at pamplemousse lacroix.. but seriously, this engagement session is just breathtaking. The cinema film looks so good too! I love how you’ve captured the coziness of in home cuddles, and also this couple’s adventurous side out in the wilds of this Rattlesnake preserve. I’m adding it to my bucket list now!